When it comes to blogging (or writing blog articles), there are several things that have to be done for the article to be effective. First, you have to do the research needed to write an accurate article. Then you need to write the article so it has the key factors to be successful, both with the reader and the search engines / spiders. It needs to have the keywords to get in front of people & to be written well enough to hold the readers attention and get them to like/share/re-post, etc… All the other elements are things that support and effect these two things. Blogging is a great way to increase traffic to a website by both drawing people through the blog articles themselves and improving the search engine listings for the website as a whole under keywords and keyphrases used in the blog articles. If you are vacationing in the Florida Keys, there are quite a few choices for airports, airlines, & travel times to your destination. Most people don’t know where to start, all the options they should be looking at or all the things that should be considered. Hopefully, this will help save you time and give you valuable information that may save you a step or two in the process. Before we get started, a quick note: NEVER book your flight before you have a vacation home reserved. Make sure you paid a deposit and have a rental agreement with a licensed vacation homeowner or rental agency. Now, lets start with the list of airports you have to choose from. There are a couple airports right in the keys. One in Key West and one in Marathon. Now, if you have your own plane, fly on a private jet or have money to burn, Marathon (MTH) is a great option. It lands you right in the middle of the Keys. Everything in the Keys is within an hour from the airport in Marathon. As far as Key West (EYW), For most people, it is quite expensive as well. The exception seems to be for those flying from Texas and the southwest United States. Most people just fly into Miami (MIA). Miami is the default in most peoples mind for the Keys because it is the southernmost part on the mainland of Florida. Miami is fairly reasonable and one hour from Key Largo, two from Marathon & three from Key West. A couple of the problems people tend to have with flying into Miami is the time it takes to get to the car rentals, the wait in line to get the car, and the traffic to get out of Miami. The last airport I can tell you about is in Fort Meyers (RSW). Fort Meyers prices vary. If you are flying in here, it is usually because of wanting to spend some time in Everglade City, Sanibel & Captiva, or just wanting to drive across the northern everglades on the Tamiami Trail or Hwy 75 and do some air boat tours, or check out some Native American shops along the way. 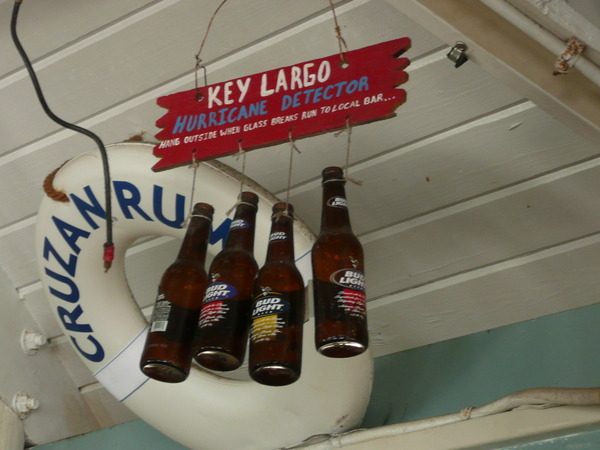 Travel time to Key Largo is about 3.5 Hours, Marathon – 4.5 Hours, and Key West – 5.5 Hours. As far as airlines, where you are flying from strongly effects which airlines are cheaper. For example, a round trip, non-stop flight from Milwaukee, Wisconsin to Fort Lauderdale, Florida is usually the cheapest if you fly Southwest Airlines. Coming from Denver, Colorado, Frontier is the cheapest way to go. I always recommend checking around directly on the airlines websites. I almost never find a cheaper flight on Priceline.com, Kayak.com, etc… Another thing you want to take into account is baggage. Southwest includes two bags. Frontier has an upgrade that only costs $20-$30 extra and includes checked bags and other nice features like extra leg room. Also keep in mind, airline ticket cost goes up considerably if you book your flight within a couple weeks. However, people who can do a ‘last minute’ reservation can often make up the difference by finding a vacation rental home that offers a ‘Last Minute Special’, which most do starting 2-3 weeks out. Don’t forget to find out from the vacation home owner if there are time limits to check in. Some places have some one that checks you in that doesn’t want to be doing that at 11:00 pm on a Saturday night. You need to figure out how early you can get to the airport, so you know how early a flight you can catch. You also need to know how late you can check in to your vacation rental so you can figure out what time you need to land by. Remember, You have to get off the plane, get your luggage, get your rental car, probably get a bite to eat, and then drive to where ever it is that you are staying. By the way, US Hwy 1 is the road through the keys from Key Largo all the way to Key West. THE ONLY ROAD. So travel times can very greatly. What was the deadliest hurricane of all time? The costliest? What state has taken the most direct hurricane hits? How often, on average, do major hurricanes hit the US? Florida? The Florida Keys? I’ve come up with some stats and facts that may surprise you. How’s your hurricane knowledge? * Of the 10 Category 4 and Category 5 hurricanes to hit Florida since 1851, ONLY 3 of them hit the Keys. That’s an Average of 1 every 55 Years. In the 20th century, how many hurricanes hit the US? 158 hurricanes hit the US from all categories; 64 of these were categories 3-5. Florida had the most landfalls at 57 of the 158, with the majority of these being in the northwest and southeast. Texas came in second with 36, and Louisiana and North Carolina tie for third at 25 a piece. What is the busiest month in the US for major hurricane hits? By far, September has it; 36 of the 64 major hurricanes to hit all of the United States hit in September. The next busiest month was August, with only 15 of the 64. What was the deadliest hurricane on record? A 1900 hurricane slammed into Galveston, Texas killing 8,000 people. A category 4 hurricane, it struck the island with sustained winds of 140 miles per hour. With no radar, tracking, or predictions, there were no preparations made for the storm. The highest elevation in Galveston in 1900 was 8.7 feet; the 15.7 foot storm surge covered the homes and businesses like an ocean. It cost $20 million at the time; in today’s money, the damage would have cost $700 million. After the hurricane, Galveston raised a sea wall and increased the grade of the island to prevent a recurrence of the tragedy. What was the costliest hurricane on record? As most of Florida will remember, the costliest hurricane of all time was Hurricane Andrew. Andrew struck in 1992 and devastated the Homestead and southern Miami-Dade areas with sustained winds of over 156 miles per hour. The estimated cost damage was $26.5 billion. After predicting for days that the storm was taking a northerly course, most people in Miami and Homestead were unprepared for the change in path that took in through the Homestead Air Force Base and the Country Walk area. Post-Andrew construction had extremely different standards, including storm shutters being required when selling a new home. What was the most intense hurricane to strike the US? Over the Labor Day weekend in 1935, a hurricane struck the Florida Keys. With record-setting low barometric pressure of 892 mb, the tiny island of Islamorada had little chance of avoiding annihilation. 390 died in the event, as the Keys were not yet very populated. Roads, buildings, viaducts, bridges and the railroad were completely wiped out. The Labor Day Hurricane sustained winds are estimated to have reached almost 200 miles per hour. How often do major hurricanes hit the US? On average, two major hurricane (cat 3-5) strike every three years; in all categories, about five hurricanes make landfall every three years. On average, a hurricane cat 4 or higher only strikes the US once every six years. What was the busiest hurricane season on record in the Atlantic? In 1995, 11 hurricanes were recorded in the Atlantic. Named storms got all the way up to Hurricane Tanya. Allison, Dean, Erin, Gabrielle, Jerry, Opal, and Roxanne all made landfall in the US. Irene is the 1st Hurricane of the 2011 Atlantic Hurricane Season. The first 10 Tropical storms of the 2011 Atlantic Hurricane season were Arlene, Bret, Cindy, Don, Emily, Franklin, Gert, Harvey, Irene and Jose. None have yet effected the United States. In early August Hurricane Dora developed in the Pacific Ocean off the Mexico Coast but quickly diminished in intensity and posed no threat to the West Coast of the United States. Many factors must be present for a hurricane to develop and intensify, they include: Ocean temperature must be a minimum of 80 degrees to a depth of at least 150 feet. Hurricane Watch means that hurricane conditions are possible within the watch area. A watch is typically issued 48 hours before the anticipated first occurrence of tropical-storm-force winds…conditions that make outside preparations difficult or dangerous. DID YOU KNOW – Many factors must be present for a hurricane to develop, they include: Ocean temperature must be a minimum of 80 degrees to a depth of at least 150 feet. The lower layer of the atmosphere (troposphere) must contain a large degree of high humidity. The difference of the wind speed between the lower and upper atmospheres must not exceed 20 miles per hour. Thunderstorm activity must be present to start the circular spinning action and create an upward flow of air. Wind speed begins to speed up near the center of the thunderstorm center, and if barometric pressure drops, more air is sucked up into the core of the storm and wind velocity begins to increase. If wind speed increases to 74 mph (the minimum velocity for hurricane classification) an “eye” will generally begin to form, giving birth to a hurricane. The following major hurricanes either made landfall on the state or brought winds of Category 4 or 5 status to the state. Storms are listed since 1851, which is the official start of the Atlantic hurricane database. PLEASE READ to avoid a VACATION DISASTER. — IMAGINE: You get up before the sun, load up the family, drive to the airport, wade through security, hop on a plane, spend hours in the air, get off the plane, find the luggage, get to the rental car, drive a couple hours to the vacation rental home, only to find out that 14 hours after getting up and being completely exhausted, you have no where to stay. I speak to dozens of people every year that experience a vacation disaster. Sometimes they are in the Keys, having just arrived at what they thought was their vacation home, only to find out that they have nowhere to stay. Sounds like a rare tragedy right? I wish it was rare. Unfortunately, this is far to common. FACT: Vacation Home Rentals in the Florida Keys are either 7 day minimum(Weekly Rentals) or 28 day minimum (Monthly Rentals). Marathon is weekly rentals. Key West, Key Largo, Islamorada and Big Pine is mostly monthly rentals with a few weekly rentals grandfathered in. Only Hotels, Resorts and Houseboats can rent by the day. If a vacation home is advertising rentals for less than 7 days (Daily Rentals) They are either unlicensed or licensed and breaking the law. If you rent from an unlicensed rental or from someone that doesn’t follow the law and they get caught before your rental dates, you could show up for your vacation, and have nowhere to stay. Some home owners have a license number, sometimes called a PLR# or VR# from a previous year and haven’t renewed it. These rentals are just as bad as someone without a license number. If they are caught doing rentals, they will be fined and shut down as well. Marathon has someone that ‘catching illegal vacation home rentals’ is their only job. ***ONLY RENT FROM LICENSED RENTAL PROPERTIES ! ! ! Call the local chamber of commerce or the city of Marathon to verify legal rental companies or licensed home owners. If you experience a vacation disaster like this yourself, PLEASE REPORT IT. These homeowners that break the law like this, don’t care about you, the next guy, or anyone that wants to vacation in the Florida Keys. Every time an unlicensed homeowner rent to someone, they are robbing the legal rental industry. They don’t have the costs of licensing and having the vacation home up to safety codes. They also don’t pay the taxes that they are charging for. Without a license, they can’t. The rest of us that follow the laws and pay our way, lose out on rentals. Many licensed homeowners have had to close their doors because they couldn’t get enough rentals to cover all the costs.